From earliest youth she opened her heart in warm, compassionate love for all who suffered and were oppressed. 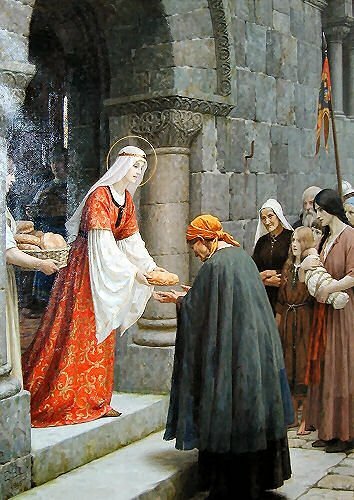 She was moved to feed the hungry and to tend the sick, but was never satisfied with warding off material need alone, always desiring to have cold hearts warm themselves at her own. The poor children in her hospital ran into her arms calling her mother, because they felt her real maternal love. All of this overflowing treasure came from the inexhaustible source of the Lord’s love, for he had been close to her for as long as she could remember. When her father and mother sent her away, he went with her into the far-away, foreign country. From the time that she knew that he dwelt in the town chapel, she was drawn to it from the midst of her childhood games. Here she is at home. When people reviled and derided her, it was here that she found comfort. No one was as faithful as he. Therefore, she had to be true to him as well and love him above everyone and everything. No human image was permitted to dislodge his image from her heart. This is why strong pangs of remorse overwhelmed her when she was startled by the little bell announcing the consecration, making her aware that her eye and her heart were turned toward the husband at her side instead of paying attention to the Holy Sacrifice. In the presence the image of the Crucified One who hangs on the Cross naked and bleeding, she could not wear finery and a crown. He stretched his arms out wide to draw to himself all who were burdened and heavy laden. She must carry this Crucified One’s love to all who are burdened and heavy laden and in turn arouse in them love for the Crucified One. They are all members of the Mystical Body of Christ. She serves the Lord when she serves them. But she must also ensure that through faith and love they become living members. Everyone close to her she tried to lead to the Lord, thus practicing a blessed apostolate. This is evident in the life of her companions. The formation of her husband is a persuasive witness to this, as well as the interior change of his brother, Conrad, who after her death, obviously under her influence, entered an Order. The love of Christ, this is the spirit that filled and informed Elizabeth’s life, that nurtured her unceasing love of her neighbors.